The Saville Life: Baby Saville #1. Week 28 (and 27) Update. Woah! This last two weeks has been a blur! I didn't totally abandon you-I promise! Best moment this week: This past week or so have been BUSY and I love it! Movement: Yes! All the time; everywhere. Anything making you queasy or sick: Not sick--just indigestion. Like. My chest is on fire. Have you started to show yet: yes! I'm definitely growing. Third trimester is here and I can tell! Milestones: Viability!!! Eva Kate's insides are fully functionable and over the next 12 weeks (ish), she will just be getting stronger and larger and ready to make it in this big ole world. Third trimester y'all. 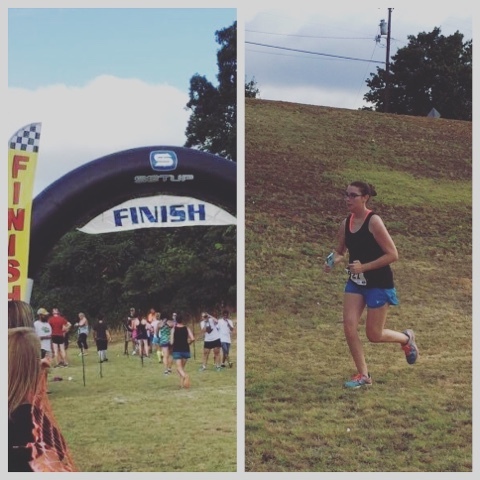 Major Happenings: Miss Eva Kate got to run in her first race! I promptly forgot my finish time and bought new shoes because she (and those extra 25 lbs) made it my hardest race ever. Slow but going is my motto currently! What's Been Going On: Feelings-wise, I'm still having some back and pelvic pain. The chiropractor has definitely helped. Life-wise: so here's this--I got the nursery painted...and then we found a house that we really like. SO, we put ours on the market and put an offer on it. 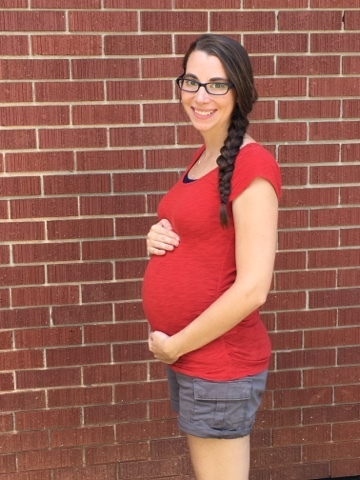 We may be moving this third trimester! If our house sells, we're out of there. We have loved our little house so so so so much and built our life there, but we're ready for a change. Looking Forward To: This week is kids camp!!! Woo hoo!!! Also, with Moose's work change, our insurance also changed. We've put off a couple of doctor's appointments--so they're coming up. Glucose test, TDap, and placenta-checking ultrasound. Hoping for great news on all counts!! !